It's the most underrated story of the offseason-- the budding war between LeBron James lifers and the denizens of the Independent Republic of Kobestan. Kobe Bean Bryant will always be worth his weight in gold in southern California, but there's simply no doubt that the Lakers are LeBron's team now. And that rather uneasy situation has fans feeling a certain way. 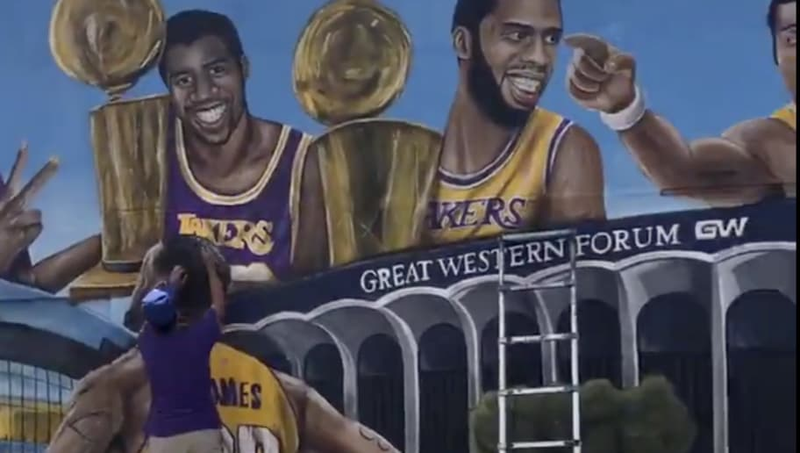 ​Multiple murals in the region depicting LBJ in the famous Purple and Gold ​have already been defaced, in fact. Luckily, there are Angelenos out there on the lookout, ready to fix things up. ​​This is what you call a good Samaritan. The battle between Kobe stans and LeBron disciples is literally never going to end. It just isn't. But at the very least, it's nice to see that some folks down in SoCal are capable of injecting some civility into the situation.